Every month a new article published by Instituto Liberal will be presented in this page. To critics of economic liberalization and international trade, it is an article of faith that the rich are getting richer and the poor poorer. "Inequality is soaring through the globalization period - within countries and across countries," Noam Chomsky told a conference last fall, summarizing this common view. That widely cited report stated: "Gaps in income between the poorest and richest countries have continued to widen. In 1960 the 20 percent of the world's people in the richest countries had 30 times the income of the poorest 20 percent - in 1997, 74 times as much." It added that "gaps are widening both between and within countries." But the biggest problem was not so technical. It was hidden in plain sight. The United Nations report and others looked at gaps in income of the richest and poorest countries - not rich and poor individuals. The result is that 2.5 billion people have seen their standards of living rise toward those of the billion people in the already developed countries - decreasing global poverty and increasing global equality. From the point of view of individuals, economic liberalization has been a huge success. "You have to look at people," says Professor Sala-i-Martin. "Because if you look at countries, we do have lots and lots of little countries that are doing very poorly, namely Africa - 35 African countries." But all Africa has only about half as many people as China. 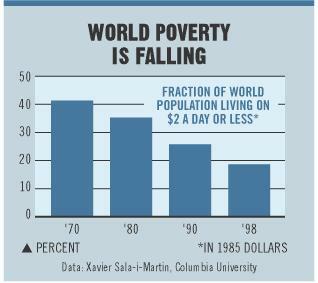 In 1970, global income distribution peaked at about $1,000 in today's dollars, a common measure of poverty ($2 a day in 1985 dollars). In 1998, by contrast, the largest number of people earned about $8,000 - a standard of living equivalent to Portugal's. Nigeria's economy has actually shrunk over the last three decades, and the absolute poverty rate - the percentage of the population living on less than $1 a day in 1985 dollars - skyrocketed to 46 percent in 1998 from 9 percent in 1970.